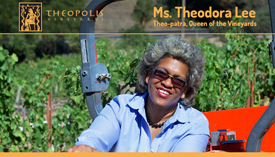 Comments: Theopolis Vineyards is a small lot vineyard and hand-crafted winery located in California's prestigious Yorkville Highlands of the Anderson Valley. Situated along Highway 128 in southeastern Mendocino County near the border of Sonoma County, the AVA is a highly elevated, rugged interior wine-growing area. Established in 2003, Wine Critic Robert Parker bestowed upon wine made from grapes harvested from Theopolis Vineyards a stellar rating of 94-96 points, a spectacular showing for the vintner's first harvest in 2006.